h = pzplot(sys) plots the poles and transmission zeros of the dynamic system model sys and returns the plot handle h to the plot. 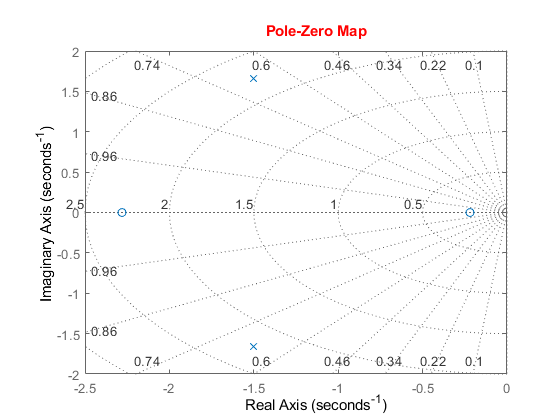 Use this function to generate a pole-zero map with customizable plot options such as FreqUnits, TimeUnits, and IOGrouping. For more information about using and interpreting pole-zero maps, see pzmap. pzplot(sys) plots the poles and transmission zeros of the dynamic system model sys. x and o indicates poles and zeros respectively. 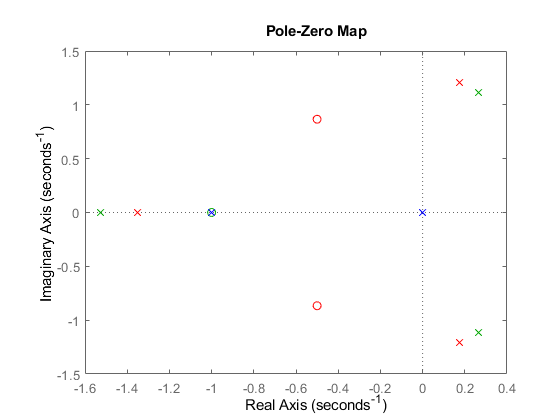 pzplot(sys1,sys2,...,sysN) displays the poles and transmission zeros of multiple models on a single plot. You can specify distinct colors for each model individually. pzplot(ax,...) plots into the axes specified by ax instead of the current axis gca. pzplot(...,plotoptions) plots the poles and transmission zeros with the options specified in plotoptions. For more information on the ways to change properties of your plots, see Ways to Customize Plots. Change the color of the plot title. To do so, use the plot handle, h.
Plot the poles and zeros of the model array. Define the colors for each model. For this example, use red for the first model, green for the second and blue for the third model in the array. Create the custom option set using pzoptions. For this example, specify the grid to be visible. Use the specified options to create a pole-zero map of the transfer function. Dynamic system, specified as a SISO or MIMO dynamic system model, or an array of SISO or MIMO dynamic system models. Dynamic systems that you can use include continuous-time or discrete-time numeric LTI models such as tf, zpk, or ss models. If sys is a generalized state-space model genss or an uncertain state-space model uss, pzplot returns the poles and transmission of the current or nominal value of sys. If sys is an array of models, pzplot plots the poles and zeros of each model in the array on the same diagram. Axes handle, specified as an axes object. If you do not specify the axes object, then pzplot uses the current axes gca to plot the poles and zeros of the system. Pole-zero plot options, specified as an options object. See pzoptions for a list of available plot options. 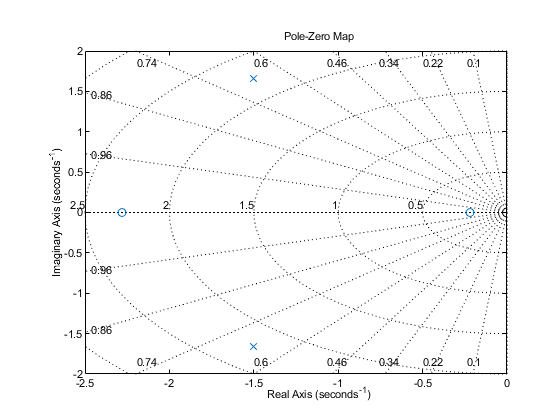 Pole-zero plot options handle, returned as a scalar. Use h to query and modify properties of your pole-zero plot. 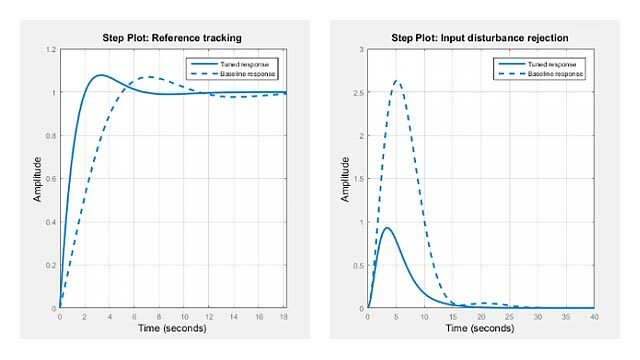 You can use this handle to customize the plot with the getoptions and setoptions commands. Use sgrid or zgrid to plot lines of constant damping ratio and natural frequency in the s- or z-plane.